Patients are our first priority. KYOTO MEDICAL PLANNING primarily engages in 4 types of business. We are a trading company that deals in medical devices, but we are also involved in manufacturing, R & D, and provision of operational support. Such a seamless system is a rarity in the healthcare industry, making it one of our strengths. Our mission is to gain the utmost trust of healthcare professionals and to identify their potential needs, to provide accurate and timely advice, to meticulously and rapidly develop new products, and to push the envelope of cutting-edge medical care. “Patients are our first priority” (everything we do is to improve the lives and health of patients). This motto is our corporate philosophy and it is the starting point for everything we do. We want to minimize the physical burden on patients and we hope to encourage and sustain the health of a wide range of patients. We manufacture products “with people in mind” such as biodegradable material for suture-line reinforcement and biodegradable stents, and we provide consulting services that are closely linked to the provision of medical care. These efforts have earned us esteem and trust both at home and abroad. Kyoto is a city long known for its craftsmanship and expertise, and this is where we developed the world’s first “biodegradable stent.” Most of the marketed stents are metallic. We have invested a great deal of time and money to overcome the drawbacks of conventional stents in order to help improve patient quality of life (QOL). Once a product has been manufactured, R & D with regard to that does not simply end. Our strategy is to conduct clinical trials and ensure our products comply with the law so that we can promptly bring our products to the market. This allows us to benefit patients who are using our products on a regular basis and to benefit society as a whole. In foreign markets, competition over disposable medical devices is fierce, so we must actively highlight the superiority of our products and display the fortitude to compete overseas. Mindful of our leading role in the development of biodegradable stents, we will strive to help medical professionals and patients around the world. A stent is used primarily to dilate a narrowed blood vessel from the inside and to support that vessel as it heals. Many existing stents are made of metal and remain in the body throughout the patient’s lifetime. These stents lead to restenosis and they hamper further treatment. Thus, KYOTO MEDICAL PLANNING developed the world’s first “biodegradable stent.” Once the stent has supported a blood vessel for a certain amount of time, the stent breaks down into water and carbon dioxide. Thus, this biocompatible medical device is revolutionary since it leaves no foreign materials in the body. 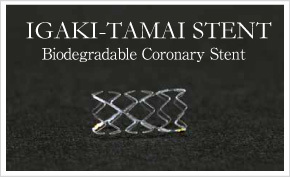 KYOTO MEDICAL PLANNING is developing the Igaki-Tamai Stent® to unblock coronary arteries, and KYOTO MEDICAL PLANNING successfully commercialized the Remedy™ biodegradable peripheral stent in 2007. 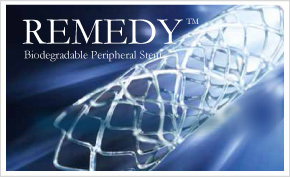 Currently we are developing an upgraded version of the Remedy™ as well as a drug eluting stent based on this stent. If you have any inquiries, please contact us. Copyright (C) 2015 KYOTO MEDICAL PLANNING Co., Ltd. All Rights Reserved.